I have watched season 1-4 in less than 1 week, just so I can catch up with the season 5 premiere. I already missed the premiere, but I will watch the premiere and the new episode this Monday. This show is amazing. It's so incredibly morally wrong, but man, I love it! On another note, the party is scheduled! 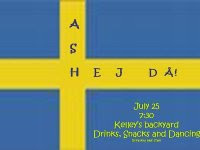 July 25th at 7:30 at my moms house! I'm really excited and she made the cutest little picture for it, she even looked up how to say "good bye" in Swedish. What a funny gal. I'm really excited! I even went and bought a Swedish/English dictionary today with my Borders gift card! Haha. Hopefully this...helps. Seeing as my Swedish is, probably the worst ever attempt at Swedish...ever. Also, I have bangs now, and I love them. Mom thinks I look like Cher or Ringo Star, that concerns me. And Marshall thinks I look like Cleopatra, I guess that's better? I had SUCH a great time with my sisters, Emily and Aliza. 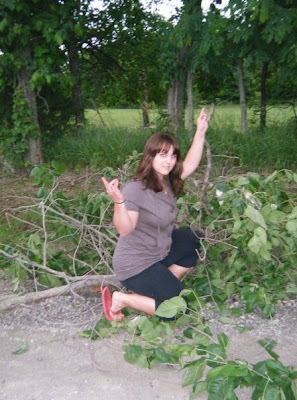 We found a tree branch and decided to have some fun. So here you go and here are the bangs! Oh yea! I'm SUCH a dork! But it's ok, Fredrik still loves me. We have this Fancy Nancy word book and "xenophile" is the "x" word. I taught the boys that you are a xenophile! And I vote that Cleopatra IS better...don't you think Beth sees a little bit of Cher in everyone? She kind of sees the world in Cher-colored glasses. Trying to be a kitchen queen using the metric system, ingredients in swedish and a husband that doesn't like baked good. : : I would like to buy one of these and put it by the beach.